"Before" picture of this brick fireplace. 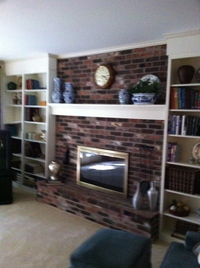 What a change to cover the brick and add limestone tile along with lowering the mantel shelf and adding mantel legs. This made the room feel lighter, larger and updated. The homeowner was more than thrilled with the result. This Before and After was done back in 2008 and the result is still current 4 years later and beyond. Simplifying the upholstery choice made all the difference and created a sense of calm and unity. We upholstered the furniture in new fabrics, added new lamps, art and window treatments.